Twenty people huddled together in passionate discussion, peppered with words like “iteration,” “cycle” and “feedback.” They were not geeks partial to jargon, nor hard-core gamers; they were actually elementary school teachers participating in Grinding New Lenses, a unique four-week professional development intensive and summer camp for kids held in July 2011 at DePaul University. The camp’s first strand, Short Circuits, leveraged physical computing and soft circuits as the context for exploring a collaborative design process and systems thinking. Using conductive thread, Velcro, and LEDs, students worked to integrate electronics into bracelets, T-shirts, and backpacks, while learning the basics of circuitry. Melissa Morgenlander, a co-author of the Short Circuit curriculum, was particularly impressed by the teachers’ ability to use the material to help students become fluent in systems thinking. Then they used Gamestar Mechanic to begin designing their own games. The Gamestar Mechanic team of teachers, Eric Tuck and Deirdre Floyd, emphasized pattern recognition, as students prepared to enter the week’s final challenge: designing a game within tight design constraints. The challenge pushed students to think critically about the commonalities and contrasts that a single set of design principles can give rise to, and how these commonalities and differences affect the experience of play and the ultimate success of a game. The camp’s third strand on digital storytelling using Scratch aimed to cultivate students’ ability to see their own community from a systems perspective. Scratch is an easy-to-use building-block-based programming language students can use to create short animated digital stories, in much the same way that kids can use Lego blocks to build buildings. Teachers began by providing students with models of systems thinking in books like Dr. Seuss’ The Lorax or Laura Joffe Numeroff’s If You Give a Mouse a Cookie. Students quickly caught on and began using Scratch to create their own narratives about issues that systematically impact their own communities. Students were tasked with identifying how particular community issues originated and how and why they persisted, along with possible solutions. The Scratch teacher team, composed of Janie Brown, Jenilyn Redila, and Trina Williams, was enthusiastic about the students’ responses to Scratch and reported that students quickly grasped the relationships and connections involved in both good computing and good storytelling. Brown, a teacher-consultant at the University of Central Arkansas, commented, “Once we collectively look at the stories, we’re all able to see the systems more clearly. Students often compare their stories, which allows them to discover other aspects of a system. They are thinking deeply and applying their thinking.” Ms. Redila expressed wonder at how totally immersed students were in their tasks, despite summer vacation . . . and a heat wave! Grinding New Lenses is part of a three-year grant from the MacArthur Foundation, awarded to Kylie Peppler, Melissa Gresalfi, Nichole Pinkard, and Katie Salen. 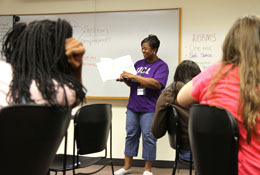 Many of the camp’s student participants will enter ChicagoQuest this fall in the sixth and seventh grades. 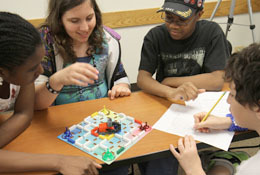 ChicagoQuest is the first adaptation of the unique game-like learning model pioneered at the Quest to Learn public school in New York City, which was profiled in the New York Times article, Learning by Playing: Video Games in the Classroom.